This year, the kids were not interested in selling their candy to the dentist. So, it just might be the last year we go to much more than a trunk or treat. They ended up with far too much candy ... and I know it will be a battle to keep them from eating it. But they sure were cute! We went to Flatirons on the 28th, then Aspen Ridge for a Trunk or Treat. Shiloh and Landon are just getting too big for this ... so Steve says. 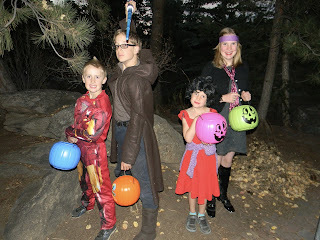 And the Littles, well, they are just adorable dressing up and all. It has become far more than I ever intended.